A caveat: For about a year and a half, including some of the time when these recordings were made, I lived right around the corner from Eric La Casa, in Paris' 19th Arrondissement. Leafing through the photographs included in the accompanying booklet (which includes a short essay, in French and English, by La Casa), I see many familiar sights and, more, am well acquainted with the general sense of architecture in that area � bland but comfortable apartment buildings put up in the early 90s on the sites of former stockyard housing � and, to be sure, I recall the daily life there. La Casa does field recordings but his work is different from most. He doesn't seek out exotic places or unusual sound fields. He doesn't hyper-amplify small sounds to reveal hidden sonic worlds. He doesn't tweak what he finds (at least not overtly) to render the sounds more intriguing to our ears. He simply presents environments, often, as here, ones with which he is very familiar, but presents them as heard by someone with very sensitive ears, not just to the aural characteristics of the sounds themselves but to what they mean, what they imply. The disc contains three sections, each lasting between 20-30 minutes. The first, "Les saisons du bruit de fond" ("Seasons of background noise"), covers sounds made over a period of a year, seemingly recorded from the windows of La Casa's apartment. There's the constant hum of the city, wheels on roads and engines; there's a thunderstorm; there are the distant sounds of people voices on the streets, the clangs of construction, the ringing of phones. It's at once dense and transparent and perhaps tinged with sadness, the day to day that always changes on the one hand but operates within restricted boundaries. As difficult as it may be to imagine such a recording as being poignant, it somehow is. Next we have "Les �v�nements ext�rieurs" ("Outside events") and the immediate concentration is on the industrial: a very loud and assaultive wave of drills boring into metal and concrete. It gradually shifts to a more spacious context, but no less active � sirens, bangs (firecrackers? ), people yelling, children laughing. It's difficult to determine what's going on; sometimes it seems like a sporting event, other times a demonstration. Maybe both, or neither. It ends with a distant marching band amidst bird calls and dull pounding. The final track, "Le monde int�rieur" ("The inside world") might be, oddly, the most difficult as its elements are the most quotidian, an array of truly everyday sounds with little inherent drama but which still, slowly over its 29 minutes, build in subtle intensity to make for a riveting experience, There's a scouring sound that could be water flushing through a metal tube that is especially gripping. A strong sense of Luc Ferrari pervades in the diaphanous creation of structure from the most ordinary of materials � it's all stunning. La Casa has, for a number of years, been one of the premier practitioners of the art of field recording. 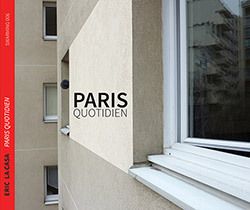 Paris Quotidien is yet another exceptionally strong addition to his catalogue.